Iceland is an isolated volcanic island, which was developed about 20 million years ago, located in the north of the Atlantic Ocean. The first possible mention of Iceland is by a Greek scholar called Pytheas, he travelled around around world and found an island that he named Thule and many believe to be Iceland. Monks and priests from Ireland came to Iceland but left when the Vikings came. Vikings immigrated to Iceland in the 9th century from Norway mostly because the population increased a lot in their country, and in Iceland there was a lot of a uninhabited land. Raven-Flóki was a Norwegian Viking that sailed to Iceland and used ravens to find the way to the country. He lived in Iceland for a year, but then he moved back to Norway and named the island Iceland because he thought that the winter was so cold and his farm was destroyed. Iceland had limited resources and the settlers had to grow plants and take good care of their animals. Ingólfur Arnarson arrived in Iceland in 874 and built his farm in Reykjavík and lived there for the rest of his live with his wife and their son. Ingólfur was in charge of who settled close to Reykjavík, he was the leader over South-West of Iceland. Many people say that Raven-Flóki was first to find Iceland but others say it was Ingólfur Arnarsson, we cannot really know because there are not any confirmed documentation about who really first found Iceland. One of the old Sagas – Snorra-Edda. Most of the oldest documentation about Iceland, is written in the ancient Viking language called Old Norse. The sagas were written on calf skin. Icelandic is one of the languages which are closest to Old Norse and many Icelanders can read and understand it. In 1120 and until 1230 there were written documentations about Iceland, how it became a country, how the first people came and how they lived. During that time many people started to write poetry and short-stories, and folk stories that have been handed down orally on for generations. 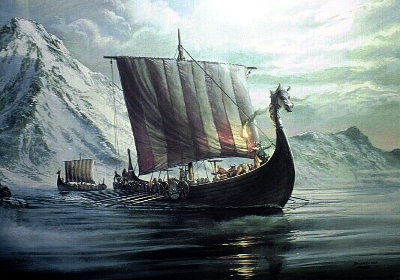 The first Vikings that came to Iceland worshiped the Norse gods of Asgard. The Vikings established the Althing, the oldest parliament in the world that is still in function in 930. Iceland converted to Christianity in the year 1000. Christianity did not take over completely as the nation’s religion until after the reformation in the middle of the 16th century. Iceland was an independence state for about three centuries and worked by the rules of parliament Althing, but often there were controversial issues between many groups in the society and that is why it was decided to follow the king of Norway in 1262. While Iceland became part of Norway, Icelandic leaders ruled domestically and followed the rules of Althing. In 1397 Norway and then also Iceland were submitted over to Denmark and Althing was disallowed. Alþingi – the parliament building in Iceland. In the 19th century nationalism started to grow and many Icelanders started to fight for independence for the nation and to rebuild Althing. In 1874 Iceland got a constitution and that was a big step to independence. In 1904 Iceland got autarchy, and a minister who lived in Iceland. The year 1918 the Icelandic nation got their own government but the country still had royal relations to Denmark. In 1944 there was a referendum about if Iceland should break the royal relations with Denmark. It was accepted and Iceland became a complete sovereignty. The national day of Iceland is held on 17th of June, on Jón Sigurðsson birthday, one of the most important men in Iceland’s battle for independence, in his honour. The re-established Althing gathered every year in June to formulate laws. Today the government comes together in Reykjavík. Our Althing is the oldest assembly in the world and has been constantly working since then. Iceland’s head of state is a president and the first president was elected in 1944, and since then we have had five presidents. The first and only female president in Iceland was elected in 1980, Vigdís Finnbogadóttir. She is also the first female president in the world. Our current president is Ólafur Ragnar Grímsson but he has been our president in 19 years. The location of Iceland makes the country unique in many ways. There are a lot of volcanic eruptions, floods, earthquakes, avalanches and very flexible weather which makes living difficult. All of these events have made their mark on the history, the land has changed and temperatures have changed a lot through the centuries. In the year 1783 until 1785 was an event, called Móðuharðindin. This was an eruption in volcanic craters called Lakagígar. From the eruption came a lot of poisoned gas fumes and ash that spread all over the country, grass signed, lot of animals died and also many people or about one fourth of the Icelandic nation. The gas fumes and ash also spread to other countries with clouds and wind and then were also many people that died in Europe due to harvest failure. Another bad volcanic eruption; in 1875 there was a big eruption in an Icelandic mountain called Askja, which it located on the highlands in North-East of Iceland. In this eruption there was also a lot of gas fumes that spread all over the country and ash that came from the eruption. In a short time the ash from the eruption covered most of the north-east of the country which made the land uninhabitable. In continuation of the eruption a lot of people started to immigrate to North-America in search of a better life. The eruption 1973 in the Vestmanna islands. In 1973 there was a big volcanic eruption in the Westman Islands, just of the south coast of Iceland. All the inhabitants, or about 5000 people, were evacuated to the mainland in the fishing fleet of the town and everyone got away safe. Houses were built in other towns in the country and people had to live there temporarily because of the eruption. Only one man died in this eruption because of poisoned gas fumes, but few days after the eruption started. Most of the people moved back to the West Man Islands but they had to rebuild their houses and start their life again. The eruption in Holuhraun 2014 north of glacier Vatnajökull. In 2010 there was an eruption in Eyjafjallajökull, a glacier on south Iceland, but it was not that big and there was only a lot of ash that was bad for the farmers and their animals. This eruption is famous because the ash stopped the flight all over Europe many times. 2011 was an eruption under the glacier Vatnajökull, in a caldera called Grímsvötn, Last year, 2014, there was a big eruption connected to Vatnajökull in Holuhraun, and in that one there were a lot of poisoned gas fumes that spread over the country. In towns closest to the eruption it was forbidden to go out of houses because the fumes are very dangerous for the lungs. Bergsteinn Jónsson og Björn Þorsteinsson. 1991. „Íslands saga til okkar daga“. Sögufélag, Reykjavík. Alþingi. Without date. „Um þingflokka“. Retrieved from: http://www.althingi.is/thingmenn/thingflokkar/thingflokkar/ Source obtained on: 21.09.2015. Eldstöðvakerfi. Ekkert ártal. „Askja 1875“. Retrieved from: http://eldgos.is/storgos-eftir-landnam/askja-1875/ Source obtained on: 05.10.2015. Forseti Íslands. 2012. „Fyrri forsetar“. Retrieved from: http://www.forseti.is/Fyrriforsetar/ Source obtained on: 21.09.2015. Vísir. 2. Mai 2011. „Móðuharðindin talin mestu náttúruhamfarir í sögu Bretlands“. Retrieved from: http://www.visir.is/moduhardindin-talin-mestu-natturuhamfarir-i-sogu-bretlands/article/2011110509911 Source obtained on: 05.10.2015. Wikipedia. 30. September 2014. „Móðuharðindin“. Retrieved from: https://is.wikipedia.org/wiki/M%C3%B3%C3%B0uhar%C3%B0indin Source obtained on: 05.10.2015. Wikipedia. 9. April 2014. „Þjóðveldið“. Retrieved from: https://is.wikipedia.org/wiki/%C3%9Ej%C3%B3%C3%B0veldi%C3%B0 Source obtained on: 05.10.2015.